The Ute Trail Connection is located in the Garden of the Gods Park in Colorado Springs, Colorado. 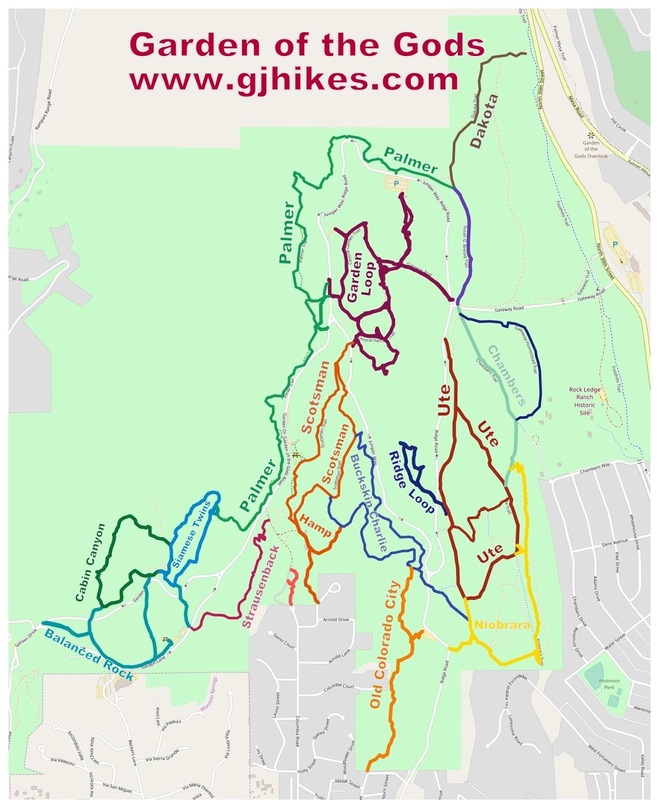 The trail begins at Lot 10 where it climbs over a hill and into the valley on the other side where it connects to the Ute trail and comes to an end. From the top of the hill there is an overlook which provides scenic views of the Central Garden and the rest of the park and surrounding area. The trail begins near the south end of Lot 10. From the parking area the trail follows a hard packed path that climbs gently as it starts out. Switchbacks help to maintain the gentle slope as the trail works its way up the small hill. Near the top of the hill a short spur breaks off on the left that leads to the overlook. As the trail continues over the ridge to the back side of the hill it becomes narrower and slightly more primitive in nature. The steeper part of the downhill stretch is terraced with beams in an attempt to slow the erosion of the trail. 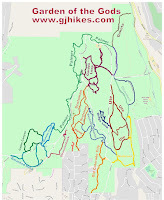 These features add some potential fun for mountain bikers going in this direction and challenges for those heading uphill. The route smooths out considerably as the trail enters the valley. We were hiking when taking the photos for this post so we turned around upon reaching the Ute trail and headed back over the hill. This photo shows the hill from the perspective of traveling in the opposite direction. There are some unique views of the Central Garden Area from the overlook as well as the rest of the park. To the west of the park Cheyenne Mountain and Pikes Peak dominate the horizon. 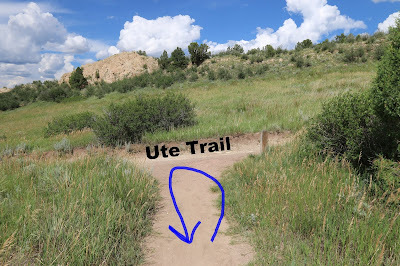 The Ute Trail Connection is a handy route that is probably more enjoyable for hikers than mountain bikers. For those with less time a hike up to the overlook and back is less than a half mile round trip and can only take 20-30 minutes. It is a good place to stretch your legs and let the kids run off some energy. As far as the rest of the trail goes if you would like to see it for yourself then all you have to do is 'Take a hike'.